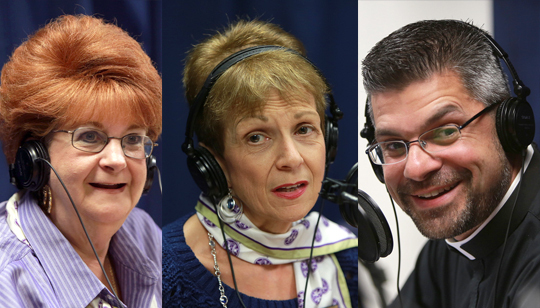 Summary of Today’s Show: Scot and Father Matt are joined by Connie and Patricia from the Massachusetts Court of the Catholic Daughters of the Americas. Since their founding in 1903, the Catholic Daughters have supported troops, popes, the poor, the infirm, the retired, and their fellow sisters in local, state and national chapters. Listen in to hear about the impact this less well known organization has in its members lives, and how it helps bring women of all ages to Christ. 1st segment: 1st Segment: Scot started the show by reminding everyone that you can now to watch the live stream of the show at BostonCatholicLive.com. Scot welcomed Fr. Matt Williams and asked if there are any upcoming events. Fr. Matt said that they have another Life Teen coming up soon but that his weekend, September 22nd, there will be another Holy Spirit Empowerment at St. Mary’s Parish, Dedham that will start with Mass at 7pm and its open for all ages. Scot welcomed Connie Pagan and Patricia Abruzzi Johnston from the Catholic Daughters of the Americas and asked to tell a little bit about the Catholic daughters and their history. Connie said that they are the largest organization for catholic women in the world and they were founded in 1903 in Utica, NY and are currently active in 42 states. Connie said that they have lay member and religious members who do social and charitable activities. They also have the Junior Catholic Daughters and are also present on some college campuses. Scot asked how many courts the Catholic Daughters of the Americas curretly have. Patricia said that there are 18 active courts and that unfortunately many members of the organization, which is over 100 years old are aging or infirmed and that depleted some of the activities but that all courts are active in participating in the activities and the fundraising. Patricia explained that local courts have their own boards and do their own fundraises and activities based on the current needs. Scot asked Connie what lead her to join the Catholic Daughters of the Americas. Connie said that she has always been active in her parish and was brought up with the Knight of Columbus because of her father and while preparing for a coalition she met a women who was involved with the Catholic Daughters on a national level who invited her to learn more about the organization and she is now with the organization for over 10 years. Scot asked Connie how does being part of the Catholic Daughters help her with her spirituality. Connie said that it’s the sisterhood of praying together, having retreats together, going on rosary walks and coming to together for Mass and adoration. Scot asked Patricia about how she got connected with the Catholic Daughters of the Americas. Patricia said that she was basically told to and was a slow starter but that after she realized there was a need for her in there that she was truly baptized by fire and just wanted more and more. Fr. Matt asked if when the Catholic Daughters of the Americas was founded if it was because of a specific need. Connie explained that the initial intent was to help the service men from WWI and their families as well as the to raise money for church initiatives like the Vatican II council and that today that is still the work of the daughters. Scot asked about the relationship between the Catholic Daughters and the parishes and the diocese. Connie said that one example of how they connect with the parishes and diocese is through pro-life events. Connie said that the current initiative Pennies for the Unborn and baby showers raised this year alone 20k. 2nd segment: Fr. Matt asked about how often the local courts meet and what is the rhythm of the meetings. Patricia explained that they need to meet at least 9 times a year and but its it is usually once a month on week evenings. Every chapter can be different but whenever possible they’ll start with Mass and the meeting will follow with coffee and discussion about regional news they receive and possible fundraising. Scot asked what types of fundraising activities will they to support the different initiatives. Patricia said that they will do different types of gathering with some kind of entertainment to attract people, like bake sales or an Irish or Italian night where they invite a guest speaker and usually there is a big turnout for these events. Connie also said that for their scholarship program for the youth they sell raffle tickets for money prizes and that is also successful. Fr. Matt asked what are some of the ways they attract new members. Patricia explained that they do membership drives at the parishes and that word of mouth from those who are members also attracts many members. Fr. Matt asked if there are any requirements or devotions required. Patricia explained that the woman does need to be catholic and although they do a lot of prayers together many women are attracted to the Catholic Daughters because of the service projects but that the faith does grow as you get involved. 3rd segment: This week’s benefactor card raffle winner is Joanne LeBlanc from Waltham, MA! She wins a CD from Matthew Kelly, “Becoming the Best Version of Yourself, and the booklet “Catholics in the Public Square” by Bishop Thomas Olmsted of Phoenix. 4th segment: Fr Matt asked how are they helping with the PAS and human trafficking issues. Connie said they have met with the Cardinal regarding the PAS issue and they are committed to hand out literatures at the parishes, to constantly update themselves and educate others on the issue. Patricia said that for the human trafficking issue they are hosting events to better educate others through guest speakers and introducing people to fair trade products.